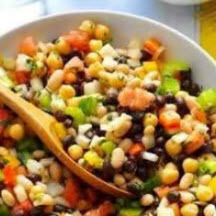 CooksRecipes has quality, kitchen-tested recipes for delicious bean salads featuring a variety of legumes such as lentils, kidney, garbanzo, edamame, black and white beans. This salad can be prepared ahead and stored several hours before serving, making it perfect for parties, taking to a potluck or a picnic. 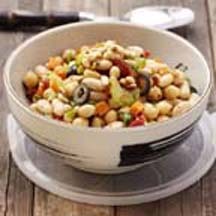 Ready-made pesto easily adds the perfect seasonings to this Mediterranean-style bean salad with celery, carrots, scallions, sun-dried tomatoes and black olives. 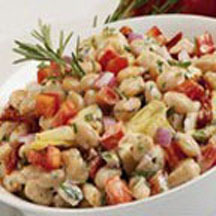 A superb recipe for marinated bean salad with three types of beans, cherry tomatoes, red and yellow bell peppers, celery, red onion and fresh herbs in a citrus vinaigrette.